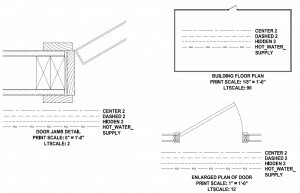 One of the most confusing and annoying problems for many AutoCAD users is making dotted and dashed lines appear dotted and dashed consistently, regardless of the scale of the drawing. Here is a way to always have your linetypes show up properly. It involves the use of a simple matrix, shown below. This Linestype Scale Matrix is a tool you will find only here at Best CAD Tips. GREEN for use when you are printing a single-scale sheet — you have only one view on the sheet, or all of the views on the sheet are created to print at the same scale (such as 1/4″ = 1′-0″). YELLOW for use when you are printing a multi-scale sheet — meaning there are multiple views on the sheet, and they have different scales (such as a floor plan at 1/4″ = 1′-0″ and a detail section at 1 1/2″ = 1′-0″). Let’s get into more detail on these settings. LTSCALE (Linetype Scale) is a setting that controls the global Linetype Scale in model space. The setting can be any positive non-zero number. 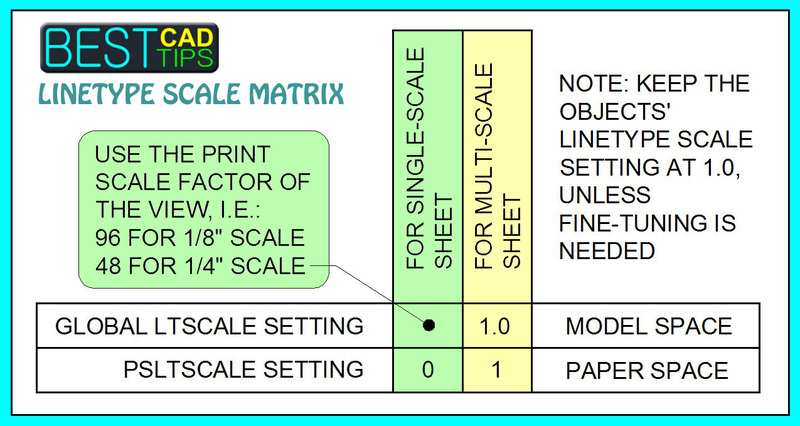 PSLTSCALE (Paper Space Linetype Scale) is a setting that controls the global Linetype Scale of an entire sheet, or layout tab, in paper space. The setting can be either zero (0) or one (1). Zero (0) tells AutoCAD to feed the current model space linetype scale setting through to paper space with no modification or adjustment. 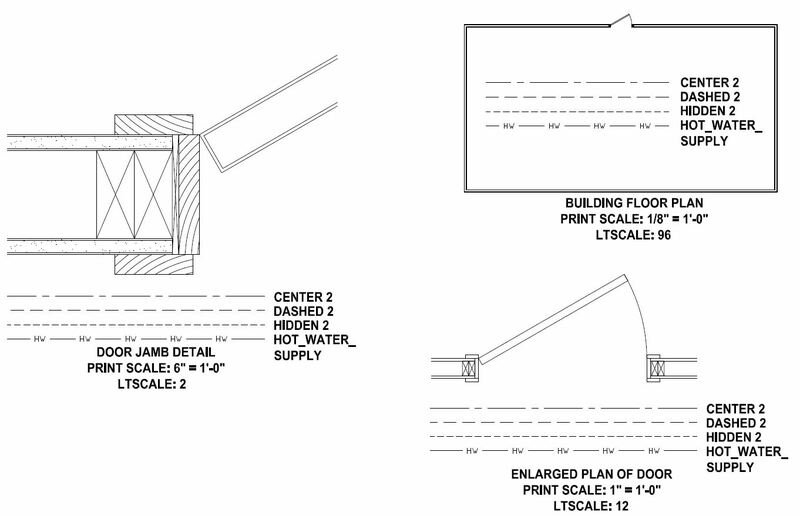 On the other hand, a setting of One (1) tells AutoCAD to make all of the objects’ linetypes in paper space appear as if they are full-scale, even in a multi-scale sheet, if the LTSCALE setting in model space is set to 1.0. Both of these settings are important for getting the linetypes to display properly on a sheet. LTSCALE is typically set to 1.0 by default when you open a new drawing file. The setting can be changed by typing LTSCALE [ENTER] in the command line, and then typing the desired LTSCALE value, followed by [ENTER]. The PSLTSCALE setting is changed using the same procedure, typing PSLTSCALE instead of LTSCALE. You can be in model space or paper space when you’re changing the setting, although I usually set the LTSCALE setting when I’m in model space and the PSLTSCALE setting in paper space. In that way I can see the results immediately. I always run the REA command (REGENALL) after changing one of these settings, otherwise you generally won’t see any change. The first step in using the Best CAD Tips Linetype Scale Matrix is to determine the Scale Factor corresponding to the print scale of the view you are working with, so you can set the global LTSCALE setting to equal the Scale Factor. If you are already a member of our community, you should already have received the Scale Factor Table. If not, email mark@bestcadtips and we’ll re-send it. Since this post is getting a bit long, I split it into two parts. 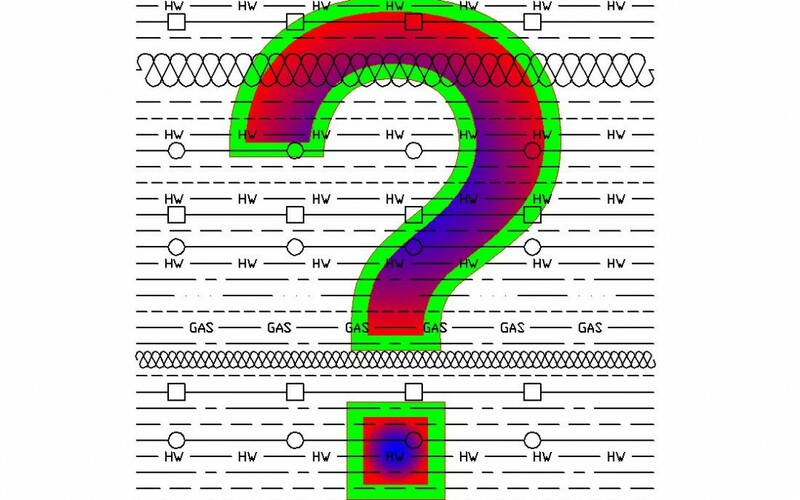 See you in Part 2 with examples of how to use the matrix, including a downloadable DWG file . . .
For Examples, CLICK HERE for Part 2.